transitional – Design Your Lifestyle. When you’re highly regarded as one of the most innovative custom kitchen and bath design firms in the world, it’s important to put your best foot forward. 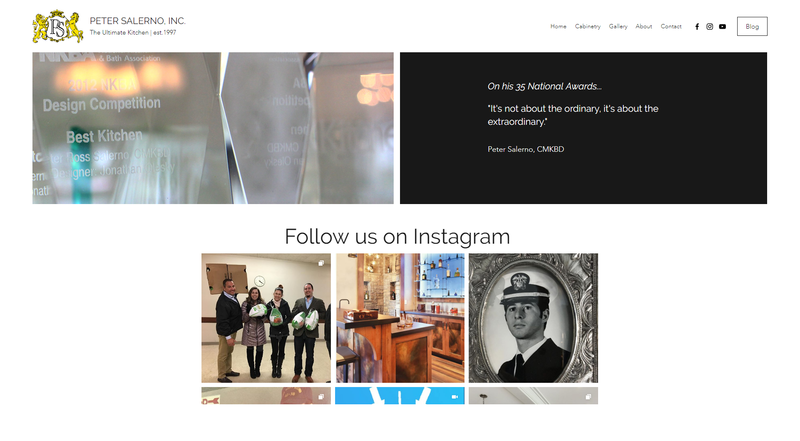 For Peter Salerno Inc. – winners of 35 national design awards since 2002 (and our parent company) – that means constantly updating its company website to stay modern and user-friendly. 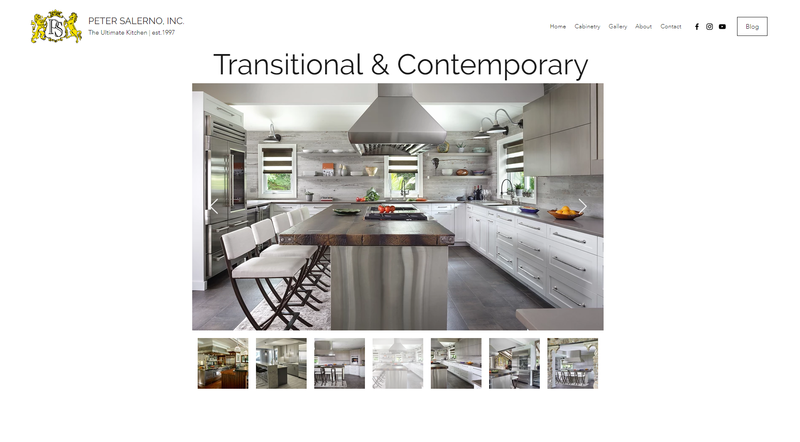 The Peter Salerno Inc. website got a fresh face and soft re-launch recently, and the resulting layout is easy to navigate, clutter-free, and aesthetically pleasing – a nod to the hottest trends in transitional design. The base color of the site went from black to a simple, clean white, reflecting the use of whites and neutrals as base colors in today’s transitional kitchen and bath designs. From the moment you land on the updated Peter Salerno Inc. home page, its aesthetic beauty and ease of comprehension is notable. It’s addition by subtraction; sweeping, vivid design galleries do the talking, while text is kept to a minimum. After all, if you’re in the market for a luxury kitchen or luxury bath design, it’s not about the words – it’s about the visual proof. These galleries exhibit the versatility and attention to detail that has made Peter Salerno one of the world’s most sought-after luxury custom designers. 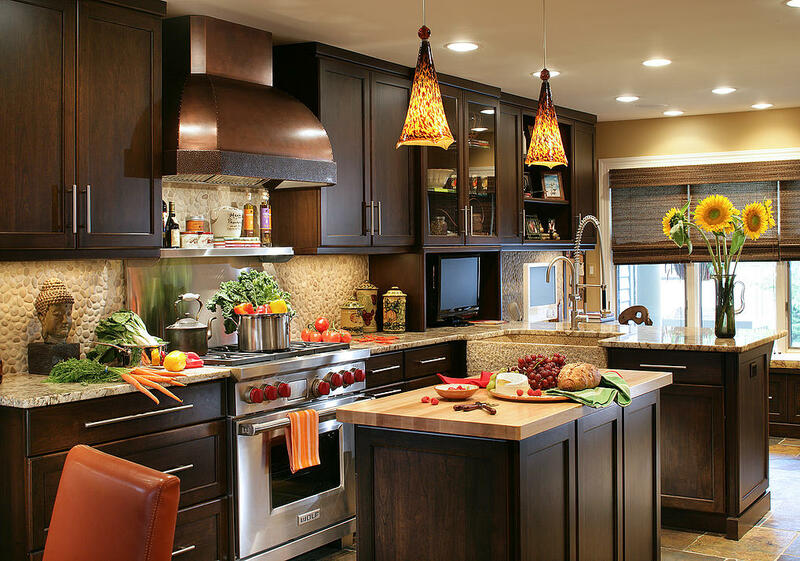 As a certified master kitchen & bath designer (CMKBD), Salerno understands the value of crafting designs that reflect the personalities, lives and tastes of his clients. If you look closely throughout his site’s design galleries, you will notice his expert craftsmanship and the subtle, personal touches that make him valuable. 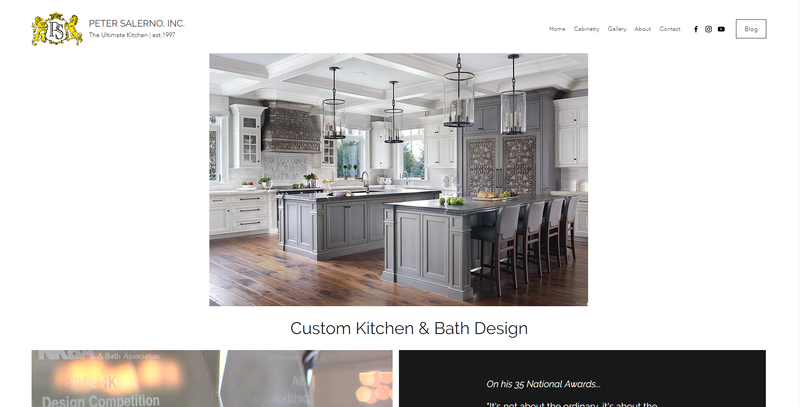 Whether you’re in the market for a kitchen design, bath design, wine cellar, bar design, a design update or refurbishment, or simply love looking at world-class home design, the new Peter Salerno Inc website is well worth your attention. Dazzling Butler’s Pantry Design Photos | Peter Salerno Inc.
A few weeks ago, we brought you exclusive photos from a stunning new kitchen design from Peter Salerno Inc. A modern kitchen that delicately balances 2018 trends with classic design elements, Peter Salerno and his team created a masterpiece that ranks with the finest new kitchen designs of the year. But the kitchen design doesn’t come alone! 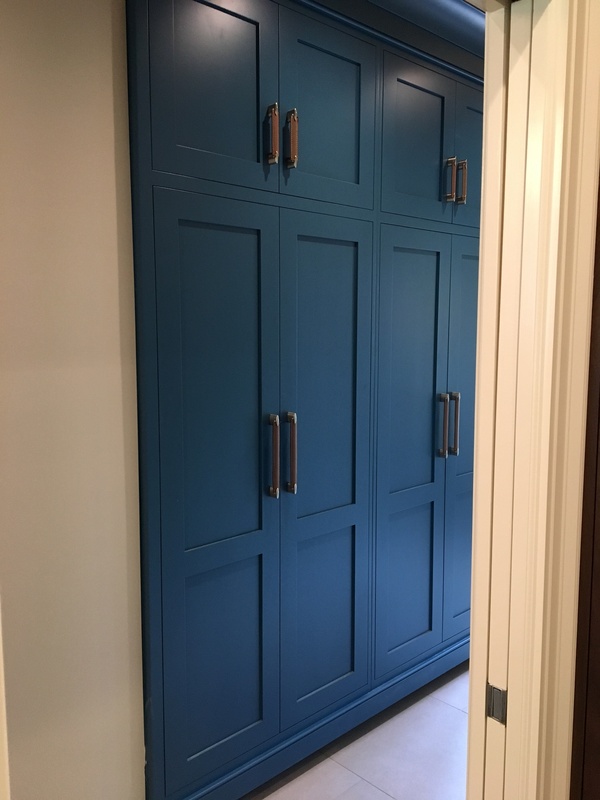 It’s accompanied by a dazzling butler’s pantry and augmented by hallway cabinetry that elevate a luxurious kitchen design into a complete transformation of a home. 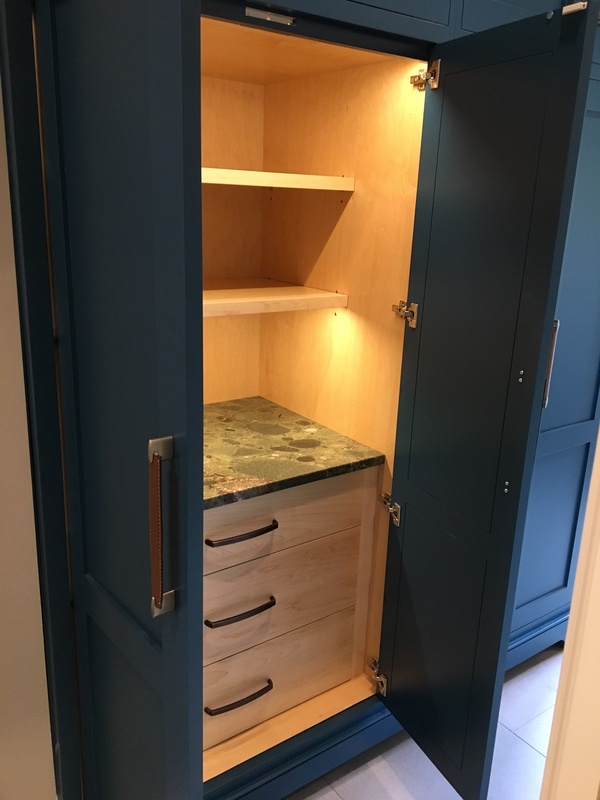 Butler’s pantry and cabinetry design from Peter Salerno Inc., 2018. The simple yet elegant brown leather pulls on the hallway cabinet, from Richelieu. Here are some of the overarching design stats, specs and points of information about supplies and sub-contractors! Reminder: For a look at the full kitchen design, along with beautiful photography and design specifications, click here! 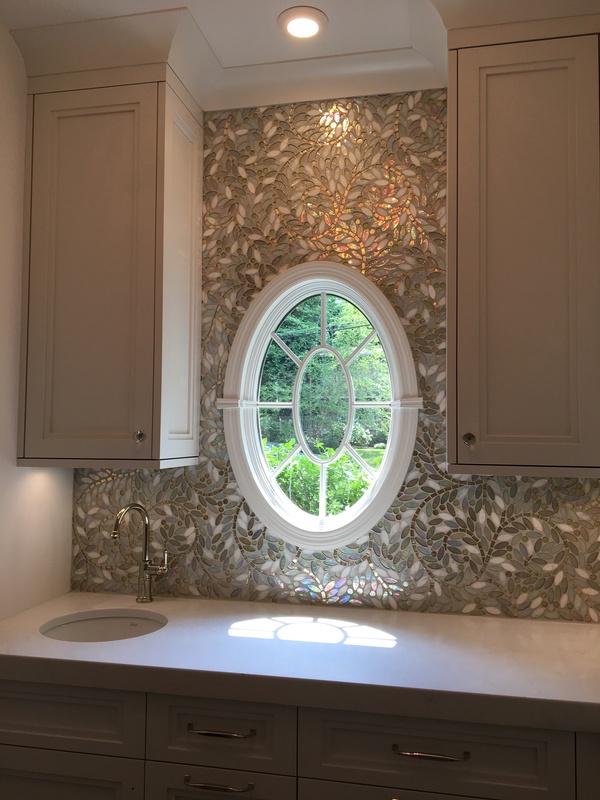 When Peter Salerno Inc. teamed up with Stratta, the Tile Boutique to create a transitional bath design they called ‘Simple Tranquility’, Peter knew they were creating something special. 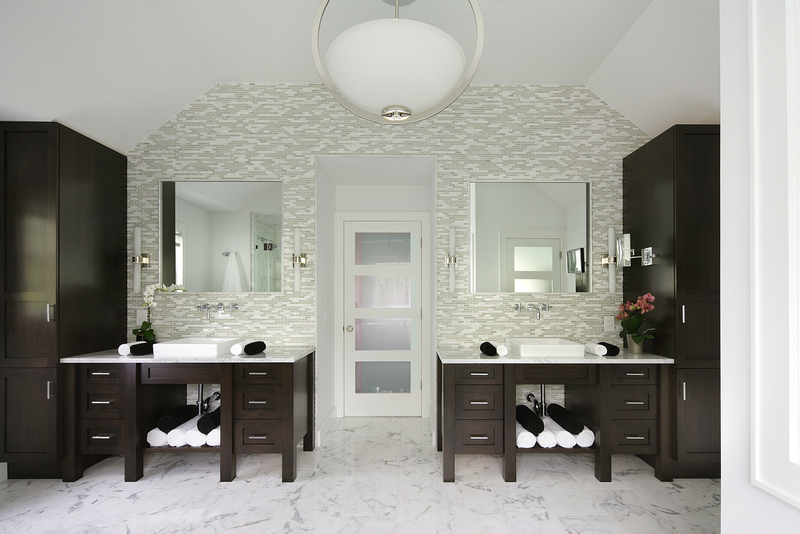 Three years later, the beautiful transitional bathroom is still a timeless, stunning design. It was awarded 2nd place nationally by Signature Kitchens and Baths magazine in March 2015. It was quite an honor for Peter Salerno and his team, who also took home two national kitchen design awards from the NKBA during the 2015 KBIS convention in Las Vegas. 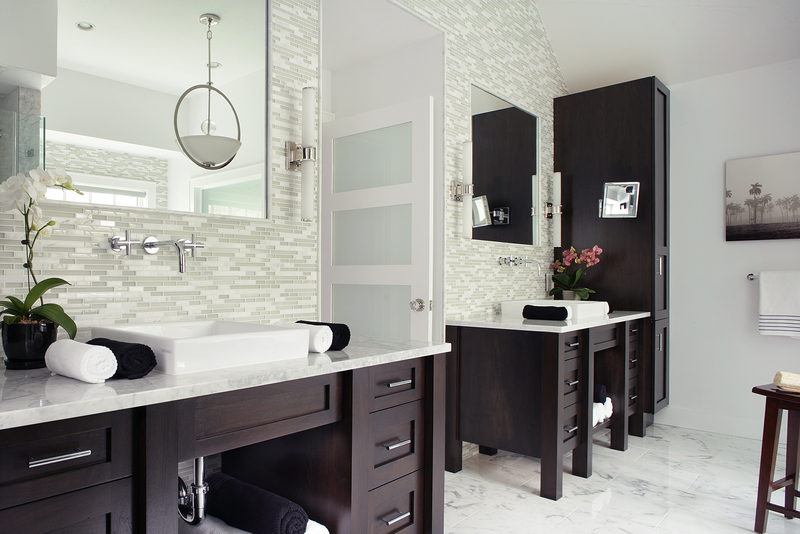 ‘Simple Tranquility’ is a transitional bathroom in Bergen County, NJ. The cabinets are walnut with an espresso stain from Peter Salerno Inc’s coveted “Mastro Rosolino” (TM) line of cabinets. The tops are marble from Stone Surfaces in East Rutherford, NJ. 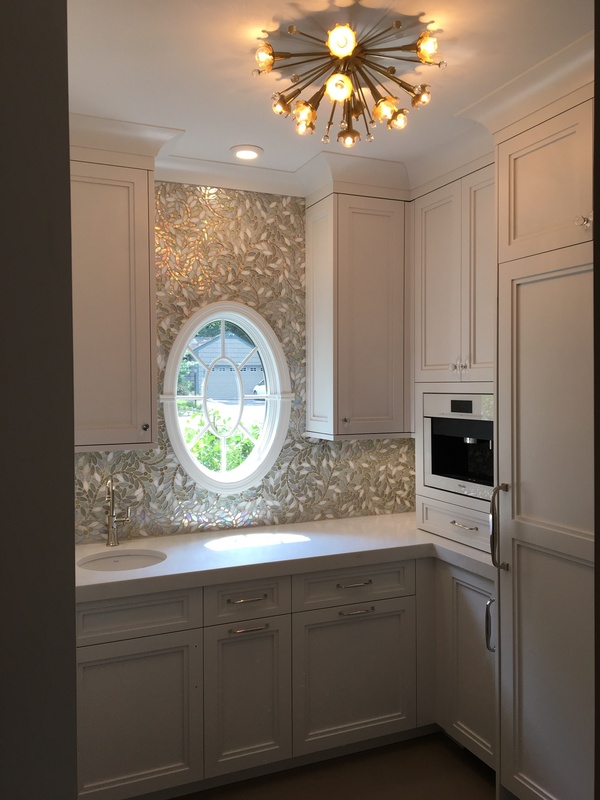 The backsplash is glass and porcelain, and the floor is marble tile by Stratta – The Tile Boutique , Wyckoff, NJ. The hardware is polished stainless from Hardware Designs in Fairfield, NJ. All the fixtures and fittings also came from Hardware Designs, while the sconces and chandelier came from Capitol Lighting in Paramus, NJ. This gorgeous transitional bath design was truly a team effort, and Peter Salerno certainly shares this award with all parties involved – Stratta, Stone Surfaces, Hardware Designs, Capitol Lighting, and his own team at Peter Salerno Inc. But the people to truly be congratulated are the owners of this nationally award-winning bathroom – it was their project, their space, and their dreams that made this room a reality! 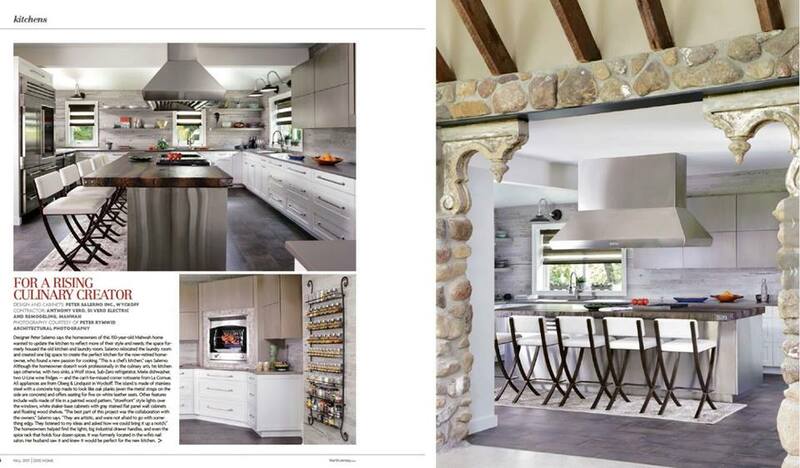 Once again, (201) Magazine sets the bar extraordinarily high with a stunning kitchen design layout. The latest Home Issue of (201) Magazine (for Fall 2017) features an article titled “For a Rising Culinary Creator”. The photography in the article is courtesy of Peter Rymwid Architectural Photography, and the kitchen was designed by Peter Salerno Inc. of Wyckoff, New Jersey. Peter Salerno Inc. kitchen design, in the Home Issue of 201 Magazine, Fall 2017. 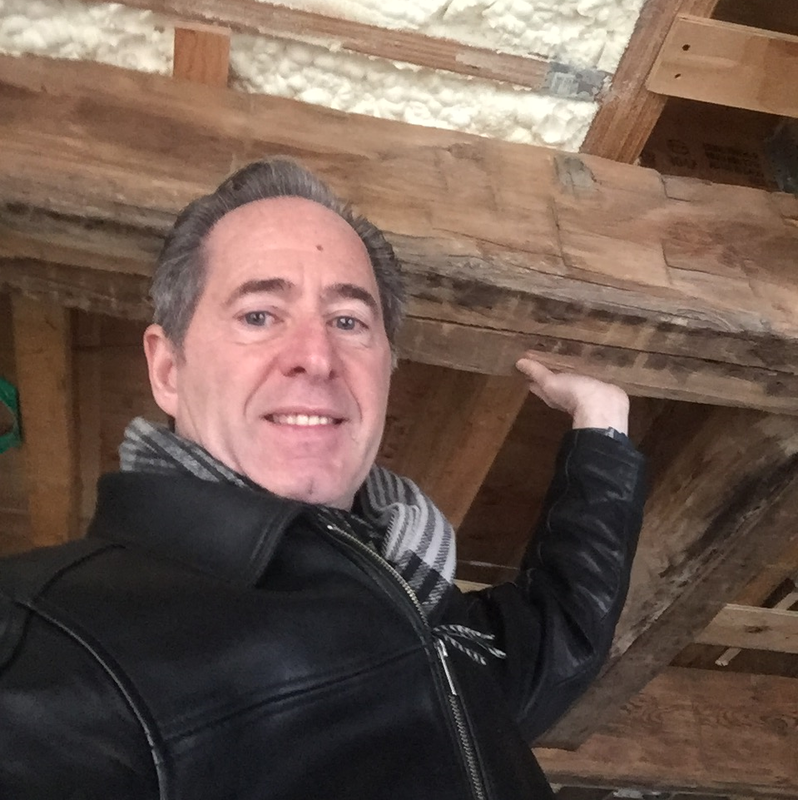 The kitchen contractor is Anthony Vero of DiVero Electric and Remodeling in Mahwah, New Jersey. 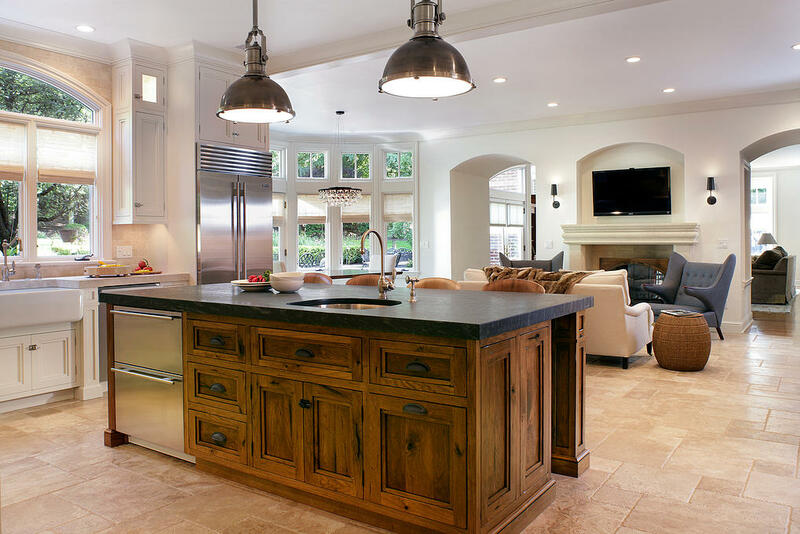 We love the exposed beams and stone work leading into the kitchen (the photo on the right), with gorgeous archway moulding framing your view into the modern kitchen design. 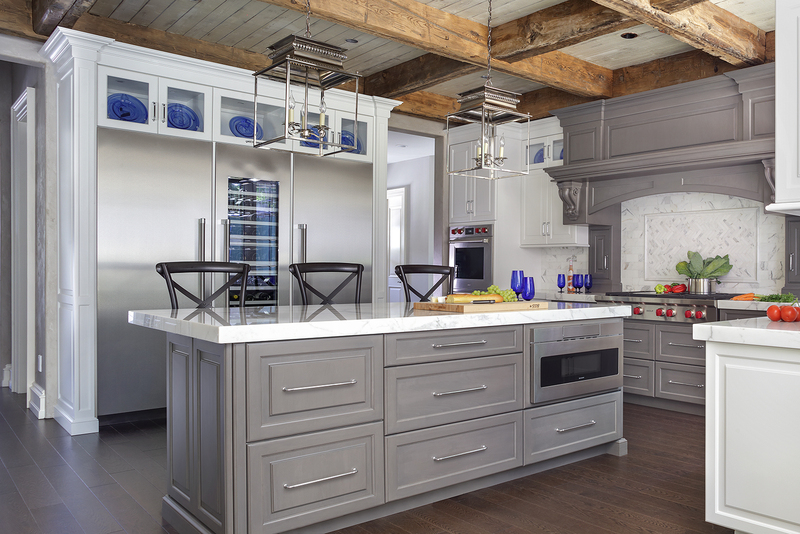 Peter Rymwid’s expert photography of the Peter Salerno Inc. design perfectly captures the custom range hood fixture over the kitchen island that serves as the focal point of the kitchen design. 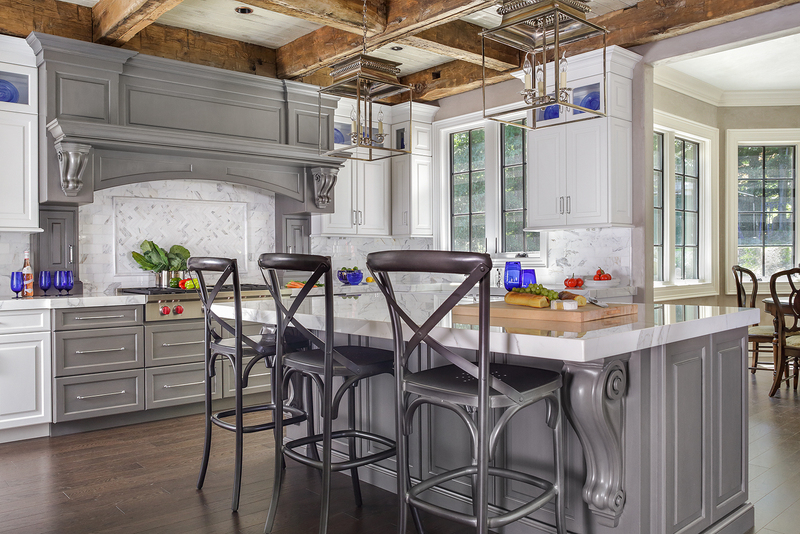 Once inside the kitchen, the “wishbone” design of the island seating really captures the imagination. As with much 2017 transitional design, neutrals and whites act as the featured color palette of the design. The crisp white of the chairs and custom Maestro Rosolino cabinetry. We also love the oversized exposed spice rack on the wall, and the beautiful La Cornue rotisserie wall feature that’s mounted several feet from it. 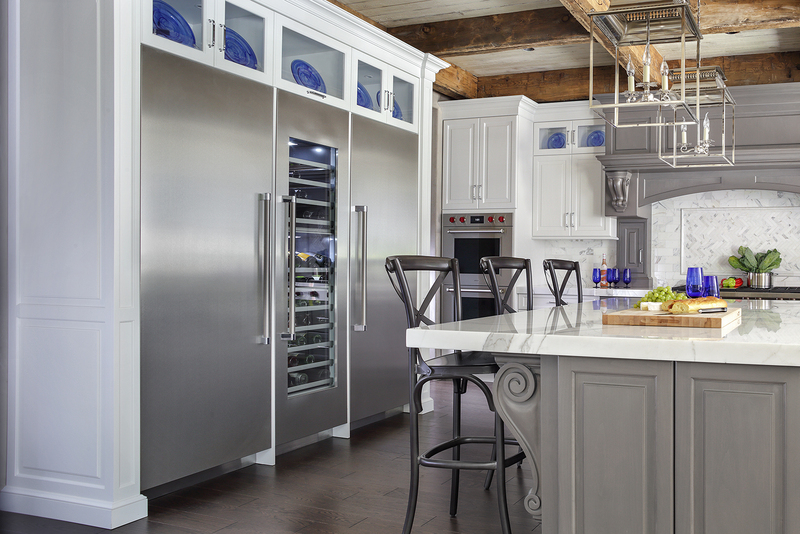 Other featured appliances come from Wolf, Sub-Zero, Miele, and U-Line (the wine refrigerators). The flow from the backsplash to the base of the kitchen island to the flooring really ties this beautiful kitchen design together. For more information about this Peter Salerno Inc. kitchen design, make sure you grab the Fall 2017 Home Issue of (201) Magazine!